Tagline The mission is a man. Saving Private Ryan is a 1998 American epic war drama film set during the Invasion of Normandy in World War II. 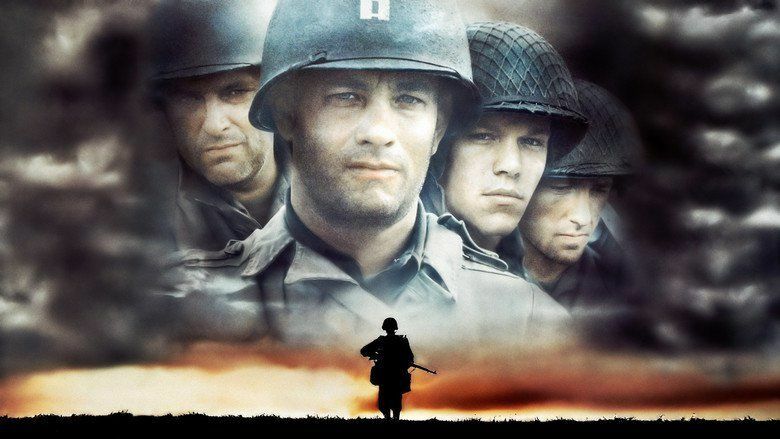 Directed by Steven Spielberg and written by Robert Rodat, the film is notable for its graphic portrayal of war, and for the intensity of its opening 27 minutes, which includes a depiction of the Omaha Beach assault during the Normandy landings. It follows United States Army Rangers Captain John H. Miller (Tom Hanks) and a squad (Tom Sizemore, Edward Burns, Barry Pepper, Giovanni Ribisi, Vin Diesel, Adam Goldberg, and Jeremy Davies) as they search for a paratrooper, Private First Class James Francis Ryan (Matt Damon), who is the last-surviving brother of four servicemen. The film received critical acclaim, winning several awards for film, cast, and crew, as well as earning significant returns at the box office. The film grossed US$481.8 million worldwide, making it the second-highest-grossing film of the year. The film was nominated for 11 Academy Awards; Spielberg's direction won his second Academy Award for Best Director, with four more awards going to the film. Saving Private Ryan was released on home video in May 1999, earning another $44 million from sales. In 2014, the film was selected for preservation in the National Film Registry by the Library of Congress, being deemed "culturally, historically, or aesthetically significant." On the morning of June 6, 1944, American soldiers land on Omaha Beach as part of the Normandy Invasion. They suffer heavy losses in assaulting German positions defended by artillery and machine guns. Captain John H. Miller of the 2nd Ranger Battalion assembles a group to penetrate the German defenses, leading to a breakout from the beach. Elsewhere on the beach, a dead soldier is face down in the bloody surf; his pack is stenciled Ryan, S.
In Washington, D.C., at the U.S. War Department, General George Marshall learns that three of the four brothers of the Ryan family were killed in action and that the fourth son, James, is missing in action in Normandy. After reading Abraham Lincoln's Bixby letter aloud for his staff, he orders that James Ryan be found and returned home immediately. Three days after D-Day, Miller receives orders to find Ryan and bring him back from the front. He assembles six men from his company—T/Sgt. Mike Horvath, Privates First Class Richard Reiben and Adrian Caparzo, Privates Stanley Mellish and Danny Jackson, medic Irwin Wade—plus T/5 Timothy Upham, a cartographer and interpreter borrowed from another unit. They move out to Neuville, where they meet a squad from the 101st Airborne Division, where Caparzo is killed by a German sniper. They locate a Private James Ryan, but quickly learn he is not their man. They eventually encounter a friend of James Ryan, who tells them that he is defending an important bridge in the town of Ramelle. On the way to Ramelle, Miller decides to neutralize a German machine gun position, despite his men's misgivings; Wade is killed in the skirmish. Miller, at Upham's urging, declines to execute a surviving German (nicknamed "Steamboat Willie") and sets him free on the condition that he surrender to the first Allied unit he encounters. Losing confidence in Miller's leadership, Reiben declares his intention to desert, prompting a confrontation with Horvath, which Miller defuses by disclosing his civilian background as a teacher, about which his men had set up a betting pool. Reiben reluctantly decides to stay. At Ramelle, Miller and the squad find a small group of paratroopers preparing to defend the bridge; one is Ryan. Miller tells Ryan about his brothers and their orders to bring him home and that two men had been lost in finding him. He is distressed at the loss of his brothers, but asks Miller to tell his mother that he intends to stay "with the only brothers [he has] left." Miller decides to join his unit with the paratroopers in defense of the bridge against the imminent German attack. Miller forms ambush positions throughout the ruined town, preparing to attack arriving tanks with Molotov cocktails, detonation cords and "sticky bombs" made from socks filled with Composition B. Elements of the 2nd SS Panzer Division arrive with infantry and armor. Although they inflict heavy casualties on the Germans, most of the paratroopers, along with Jackson, Mellish, and Horvath are killed, while Upham avoids fighting. Miller attempts to blow the bridge, but is shot and mortally wounded by Steamboat Willie, who has rejoined the Germans. Just before a Tiger tank reaches the bridge, an American P-51 Mustang flies overhead and destroys the tank, followed by American armored units which rout the remaining Germans. Witnessing Miller's shooting, Upham confronts Steamboat Willie and his group as they attempt to retreat. Steamboat Willie raises his hands in surrender, believing that Upham will accept because of their earlier encounter. Instead, Upham kills him, but lets the other Germans flee. Reiben and Ryan are with Miller as he dies and says his last words, "James...earn this. Earn it." In the present day, the elderly Ryan and his family visit the Normandy American Cemetery and Memorial and discover Miller's grave. Ryan expresses his appreciation for what Miller and the others did for him. He then asks his wife if he is a "good man" worthy of their sacrifices, to which she tells him he is. Ryan comes to attention and salutes Miller's grave. In 1994, Robert Rodat wrote the script for the film. Rodat's script was submitted to producer Mark Gordon, who liked it and in turn passed it along to Spielberg to direct. The film is loosely based on the World War II life stories of the Niland brothers. A shooting date was set for June 27, 1997. In casting the film Spielberg sought to create a cast that "looked" the part, stating in an interview, "You know, the people in World War II actually looked different than people look today", adding to this end that he cast partly based on wanting the cast "to match the faces I saw on the newsreels." Before filming began, several of the film's stars, including Edward Burns, Barry Pepper, Vin Diesel, Adam Goldberg, Giovanni Ribisi, and Tom Hanks, endured ten days of "boot camp" training led by Marine veteran Dale Dye and Warriors, Inc., a California-based company that specializes in training actors for realistic military portrayals. Matt Damon was intentionally not brought into the camp, to make the rest of the group feel resentment towards the character. Spielberg had stated that his main intention in forcing the actors to go through the boot camp was not to learn the proper techniques but rather "because I wanted them to respect what it was like to be a soldier." The film's second scene is a 20+ minute sequence recounting the landing on the beaches of Normandy. Spielberg chose to include this particularly violent sequence in order "to bring the audience onto the stage with me" specifically noting that he did not want the "audience to be spectators" but rather he wanted to "demand them to be participants with those kids who had never seen combat before in real life, and get to the top of Omaha Beach together." Spielberg had already demonstrated his interest in World War II themes with the films 1941, Empire of the Sun, Schindler's List, and the Indiana Jones series. Spielberg later co-produced the World War II themed television miniseries Band of Brothers and its counterpart The Pacific with Tom Hanks. When asked about this by American Cinematographer, Spielberg said, "I think that World War II is the most significant event of the last 100 years; the fate of the baby boomers and even Generation X was linked to the outcome. Beyond that, I've just always been interested in World War II. My earliest films, which I made when I was about 14 years old, were combat pictures that were set both on the ground and in the air. For years now, I've been looking for the right World War II story to shoot, and when Robert Rodat wrote Saving Private Ryan, I found it." The D-Day scenes were shot in Ballinesker Beach, Curracloe Strand, Ballinesker, just east of Curracloe, County Wexford, Ireland. 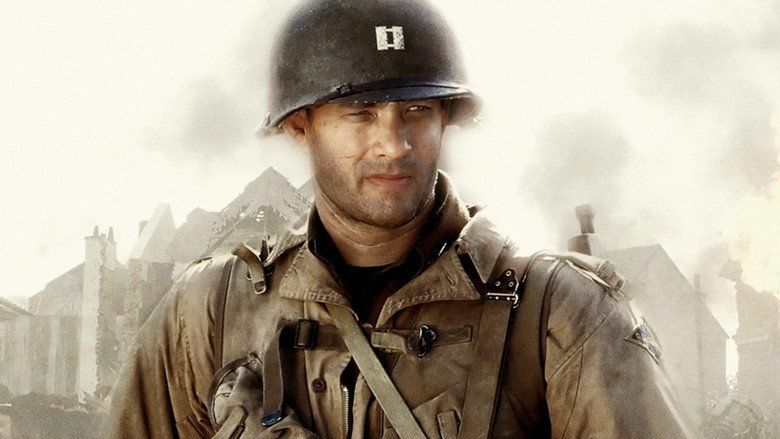 Hanks recalled to Roger Ebert that although he realized it was a movie, the experience still hit him hard, stating, "The first day of shooting the D-Day sequences, I was in the back of the landing craft, and that ramp went down and I saw the first 1-2-3-4 rows of guys just getting blown to bits. In my head, of course, I knew it was special effects, but I still wasn't prepared for how tactile it was." Filming began June 27, 1997, and lasted for two months. Some shooting was done in Normandy, for the Normandy American Cemetery and Memorial in Colleville-sur-Mer and Calvados. Other scenes were filmed in England, such as a former British Aerospace factory in Hatfield, Hertfordshire, Thame Park, Oxfordshire and Wiltshire. Production was due to also take place in Seaham, County Durham, but government restrictions disallowed this. Saving Private Ryan has received critical acclaim for its realistic portrayal of World War II combat. In particular, the sequence depicting the Omaha Beach landings was named the "best battle scene of all time" by Empire magazine and was ranked number one on TV Guide's list of the "50 Greatest Movie Moments". The scene cost US$12 million and involved up to 1,500 extras, some of whom were members of the Irish Reserve Defence Forces. Members of local reenactment groups such as the Second Battle Group were cast as extras to play German soldiers. In addition, twenty to thirty actual amputees were used to portray American soldiers maimed during the landing. Spielberg did not storyboard the sequence, as he wanted spontaneous reactions and for "the action to inspire me as to where to put the camera". The historical representation of Charlie Company's actions, led by its commander, Captain Ralph E. Goranson, was well maintained in the opening sequence. The sequence and details of the events are very close to the historical record, including the sea sickness experienced by many of the soldiers as the landing craft moved toward the shoreline, significant casualties among the men as they disembarked from the boats, and difficulty linking up with adjacent units on the shore. The distinctive signature "ping" of the US soldiers' M1 Garand rifles ejecting their ammunition clips is heard throughout the battle sequence. The contextual details of the Company's actions were well maintained, for instance, the correct code names for the sector Charlie Company assaulted, and adjacent sectors, were used. Included in the cinematic depiction of the landing was a follow-on mission of clearing a bunker and trench system at the top of the cliffs which was not part of the original mission objectives for Charlie Company, but which they did undertake after the assault on the beach. The landing craft used included twelve actual World War II examples, 10 LCVPs and 2 LCMs, standing in for the British LCAs that the Ranger Companies rode in to the beach during Operation Overlord. The filmmakers used underwater cameras to better depict soldiers being hit by bullets in the water. Forty barrels of fake blood were used to simulate the effect of blood in the seawater. This degree of realism was more difficult to achieve when depicting World War II German armored vehicles, as few examples survive in operating condition. The Tiger I tanks in the film were copies built on the chassis of old, but functional, Soviet T-34 tanks. The two vehicles described in the film as Panzers were meant to portray Marder III tank destroyers. One was created for the film using the chassis of a Czech-built Panzer 38(t) tank similar to the construction of the original Marder III; the other was a cosmetically modified Swedish SAV m/43 assault gun, which also used the 38(t) chassis. There are, however, historical inaccuracies in the film's depiction of the Normandy campaign. At the time of the mission, American forces from the two American beach areas, Utah and Omaha, had not yet linked up. In reality, a Ranger team operating out of the Omaha beach area would have had to move through the heavily enemy-occupied city of Carentan, or swim or boat across the estuary linking Carentan to the channel, or transfer by boat to the Utah landing area. On the other hand, US forces moving out of Utah would have had direct and much shorter routes, relatively unencumbered by enemy positions, and were already in contact with some teams from both US airborne divisions landed in the area. The Utah beach landings, however, were relatively uncontested, with assault units landing on largely unoccupied beaches and experiencing far less action than the landings at Omaha. The filmmakers chose to begin the narrative with a depiction of the more dramatic story of Omaha, despite the strategic inaccuracy of an impossible mission that could easily have been pursued from the other beach area. In addition, one of the most notable of the operational flaws is the depiction of the 2nd SS Panzer Division Das Reich as the adversary during the fictional Battle of Ramelle. The 2nd SS was not engaged in Normandy until July, and then at Caen against the British and Canadians, 100 miles east. Furthermore, the Merderet River bridges were not an objective of the 101st Airborne Division but of the 82nd Airborne Division, part of Mission Boston. Much has also been said about various "tactical errors" made by both the German and American forces in the film's climactic battle. Spielberg responded, saying that in many scenes he opted to replace sound military tactics and strict historical accuracy for dramatic effect. Some other technical errors were also made, often censored, including the mistaken reversed orientation of the beach barriers; the tripod obstructions with a mine at the apex. To achieve a tone and quality that was true to the story as well as reflected the period in which it is set, Spielberg once again collaborated with cinematographer Janusz Kamiński, saying, "Early on, we both knew that we did not want this to look like a Technicolor extravaganza about World War II, but more like color newsreel footage from the 1940s, which is very desaturated and low-tech." Kamiński had the protective coating stripped from the camera lenses, making them closer to those used in the 1940s. He explains that "without the protective coating, the light goes in and starts bouncing around, which makes it slightly more diffused and a bit softer without being out of focus." The cinematographer completed the overall effect by putting the negative through bleach bypass, a process that reduces brightness and color saturation. The shutter timing was set to 90 or 45 degrees for many of the battle sequences, as opposed to the standard of 180-degree timing. Kamiński clarifies, "In this way, we attained a certain staccato in the actors' movements and a certain crispness in the explosions, which makes them slightly more realistic." Saving Private Ryan was a critical and commercial success and is credited with contributing to a resurgence in America's interest in World War II. Old and new films, video games, and novels about the war enjoyed renewed popularity after its release. The film's use of desaturated colors, hand-held cameras, and tight angles has profoundly influenced subsequent films and video games. 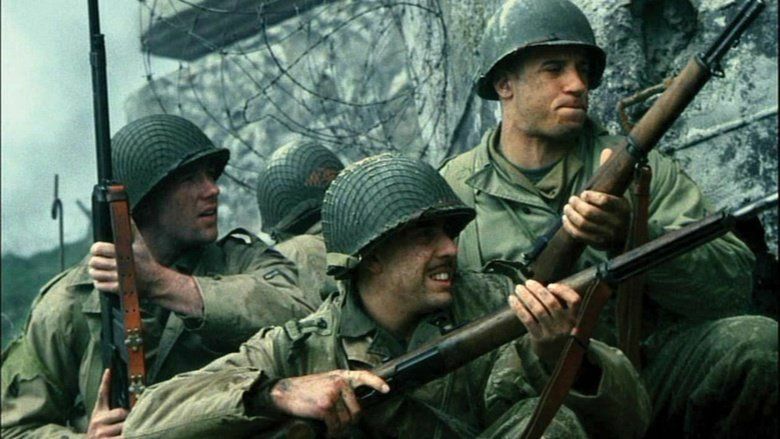 Saving Private Ryan was released in 2,463 theaters on July 24, 1998, and grossed $30.5 million on its opening weekend. The film grossed $216.5 million in the US and Canada. and $265.3 million in other territories, bringing its worldwide total to $481.8 million and making it the highest-grossing US film of the year. Box Office Mojo estimates that the film sold over 45.74 million tickets in the United States and Canada. The film received critical acclaim and has a 'certified fresh' rating of 92% on Rotten Tomatoes based on 130 reviews with an average score of 8.6 out of 10. 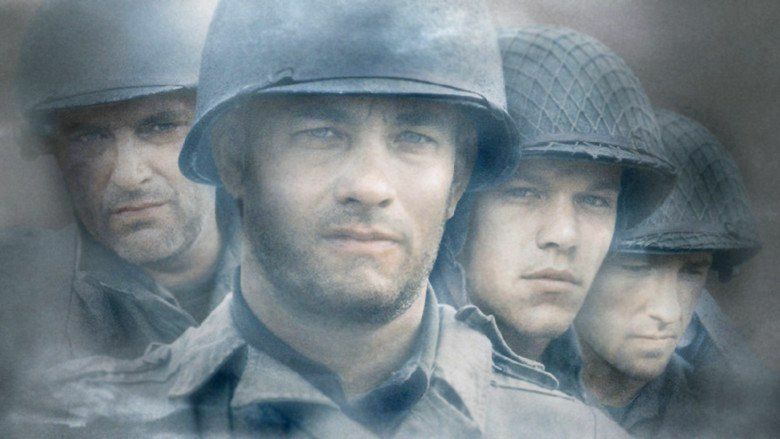 The consensus states "Anchored by another winning performance from Hanks, Spielberg's unflinchingly realistic war film virtually redefines the genre." The film also has a score of 90 out of 100 on Metacritic based on 34 reviews indicating "universal acclaim". Much of the praise went for the realistic battle scenes and the actors' performances. However, it did earn some criticism for ignoring the contributions of several other countries to the D-Day landings in general and at Omaha Beach specifically. The most direct example of the latter is that during the actual landing the 2nd Rangers disembarked from British ships and were taken to Omaha Beach by Royal Navy landing craft (LCAs). The film depicts them as being United States Coast Guard-crewed craft (LCVPs and LCMs) from an American ship, the USS Thomas Jefferson (APA-30). This criticism was far from universal with other critics recognizing the director's intent to make an "American" film. The film was not released in Malaysia after Spielberg refused to cut the violent scenes; however, the film was finally released there on DVD with an 18SG certificate much later in 2005. Many critics associations, such as New York Film Critics Circle and Los Angeles Film Critics Association, chose Saving Private Ryan as Film of the Year. Roger Ebert gave it four stars out of four and called it "a powerful experience". Filmmaker Robert Altman wrote a letter to Spielberg stating, "Private Ryan was awesome -- best I've seen." Filmmaker Quentin Tarantino has expressed admiration for the film and has cited it as an influence on his 2009 film, Inglourious Basterds. 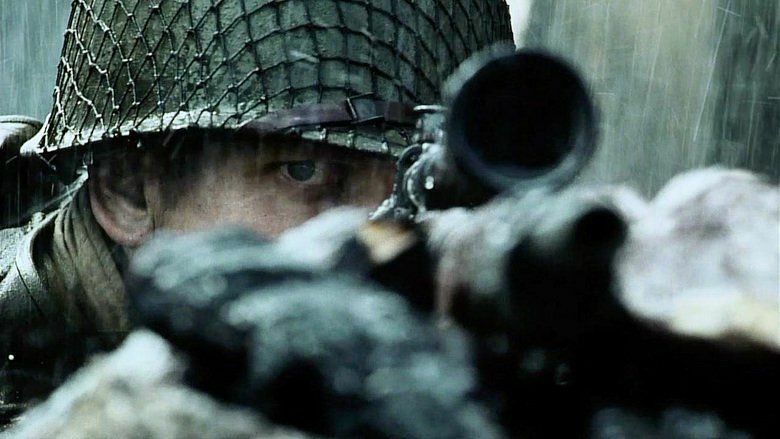 Many World War II veterans stated that the film was the most realistic depiction of combat they had ever seen. 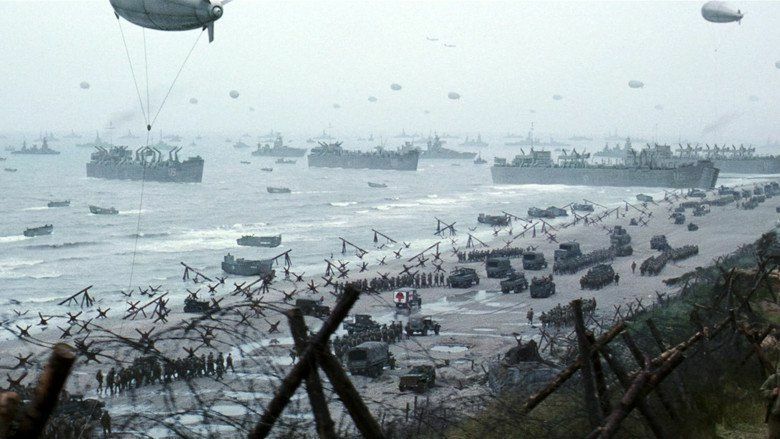 The film was so realistic that combat veterans of D-Day and Vietnam left theaters rather than finish watching the opening scene depicting the Normandy invasion. Their visits to posttraumatic stress disorder counselors rose in number after the film's release, and many counselors advised "'more psychologically vulnerable'" veterans to avoid watching it. The Department of Veterans Affairs set up a nationwide hotline for veterans who were affected by the film, and less than two weeks after the film was released it had already received over 170 calls. The film has gained criticism and negative reviews from war veterans and film critics. Film director and military veteran Oliver Stone has accused the film of promoting "the worship of World War II as the good war," and has placed it alongside films such as Gladiator and Black Hawk Down that he believes were well-made, but may have inadvertently contributed to Americans' readiness for the 2003 invasion of Iraq. 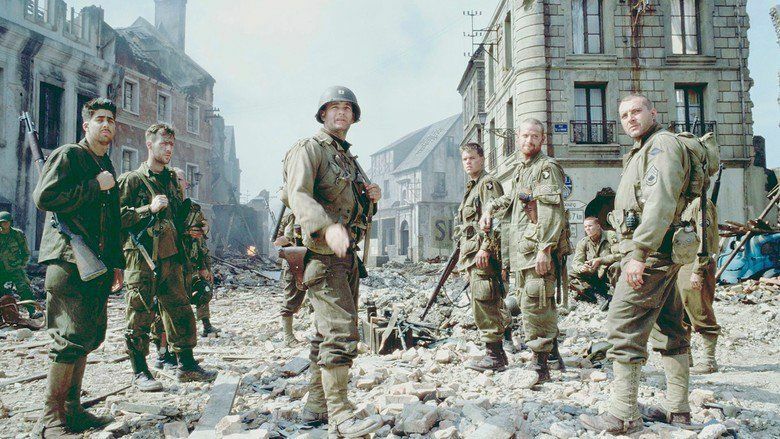 In defense of the film's portrait of warfare, Brian De Palma commented, "The level of violence in something like Saving Private Ryan makes sense because Spielberg is trying to show something about the brutality of what happened." Actor Richard Todd, who performed in The Longest Day and was amongst the first of the Allied soldiers to land in Normandy (Operation Tonga), said the film was "Rubbish. Overdone." American academic Paul Fussell, who saw combat in France during World War II, objected to what he described as, "the way Spielberg's Saving Private Ryan, after an honest, harrowing, 15-minute opening visualizing details of the unbearable bloody mess at Omaha Beach, degenerated into a harmless, uncritical patriotic performance apparently designed to thrill 12-year-old boys during the summer bad-film season. Its genre was pure cowboys and Indians, with the virtuous cowboys of course victorious." 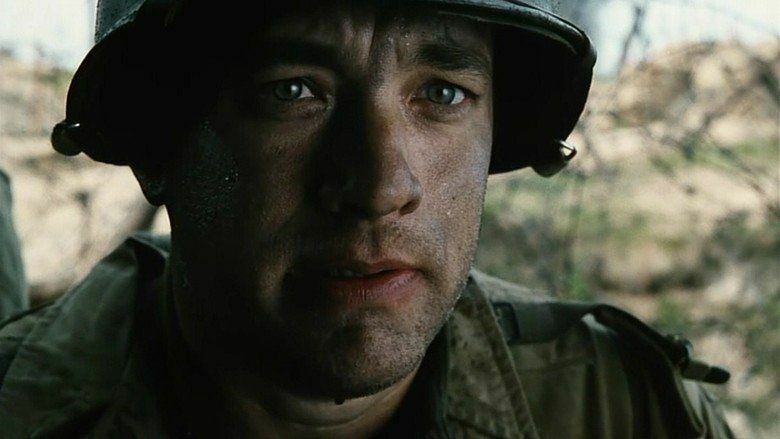 Historian James DiEugenio has argued that the film was actually "95 percent fiction" and that Tom Hanks knew this, with his goal being to "...commemorate World War II as the Good War and to depict the American role in it as crucial." The film was nominated for eleven Academy Awards, and won five including Best Cinematography, Best Sound Mixing, Best Sound Effects Editing, Best Film Editing, and Best Director for Spielberg, but lost the Best Picture award to Shakespeare in Love, being one of a few that have won the Best Director award without also winning Best Picture. The Academy's decision to not award the film with the Best Picture Oscar has resulted in much criticism in recent years, with many considering it as one of the biggest snubs in the ceremony's history. The film also won the Golden Globes for Best Motion Picture – Drama and Director, the BAFTA Award for Special Effects and Sound, the Directors Guild of America Award, a Grammy Award for Best Film Soundtrack, the Producers Guild of America Golden Laurel Award, and the Saturn Award for Best Action, Adventure, or Thriller Film. The American Film Institute has included Saving Private Ryan in many of its lists, ranking it as the 71st greatest American movie in AFI's 100 Years...100 Movies (10th Anniversary Edition), as well as the 45th most thrilling film in AFI's 100 Years...100 Thrills, the 10th most inspiring in AFI's 100 Years...100 Cheers, and the eighth best epic film in "AFI's 10 Top 10". On Veterans Day from 2001–2004, the American Broadcasting Company aired the film uncut and with limited commercial interruption. The network airings were given a TV-MA rating, as the violent battle scenes and the profanity were left intact. The 2004 airing was marred by pre-emptions in many markets because of the language, in the backlash of Super Bowl XXXVIII's halftime show controversy. However, critics and veterans' groups such as the American Legion and the Veterans of Foreign Wars assailed those stations and their owners, including Hearst-Argyle Television (owner of 12 ABC affiliates); Scripps Howard Broadcasting (owner of six); and Belo (owner of four) for putting profits ahead of programming and honoring those who gave their lives at wartime, saying the stations made more money running their own programming instead of being paid by the network to carry the film, especially during a sweeps period. A total of 65 ABC affiliates—28% of the network—did not clear the available timeslot for the film, even with the offer of The Walt Disney Company, ABC's parent, to pay all fines for language to the Federal Communications Commission. In the end, however, no complaints were lodged against ABC affiliates who showed Ryan, perhaps because even conservative watchdogs like the Parents Television Council supported the unedited rebroadcast of the film. Additionally, some ABC affiliates in other markets that were near affected markets, such as Youngstown, Ohio, ABC affiliate WYTV (which is viewable in parts of the Columbus, Cleveland, and Pittsburgh markets, none of which aired the film) and Gainesville, Florida, ABC affiliate WCJB-TV (which is viewable in parts of the Orlando and Tampa markets), still aired the film and gave those nearby markets the option of viewing the film. TNT and Turner Classic Movies have also broadcast the film. The film was released on home video in May 1999 with a VHS release that earned over $44 million. The DVD release became available in November of the same year, and was one of the best-selling titles of the year, with over 1.5 million units sold. The DVD was released in two separate versions: one with Dolby Digital and the other with DTS 5.1 surround sound. Besides the different 5.1 tracks, the two DVDs are identical. The film was also issued in a very limited 2-disc LaserDisc release in November 1999, making it one of the very last feature films to ever be issued in this format, as LaserDiscs ceased manufacturing and distribution by the year's end, due in part to the growing popularity of DVDs. 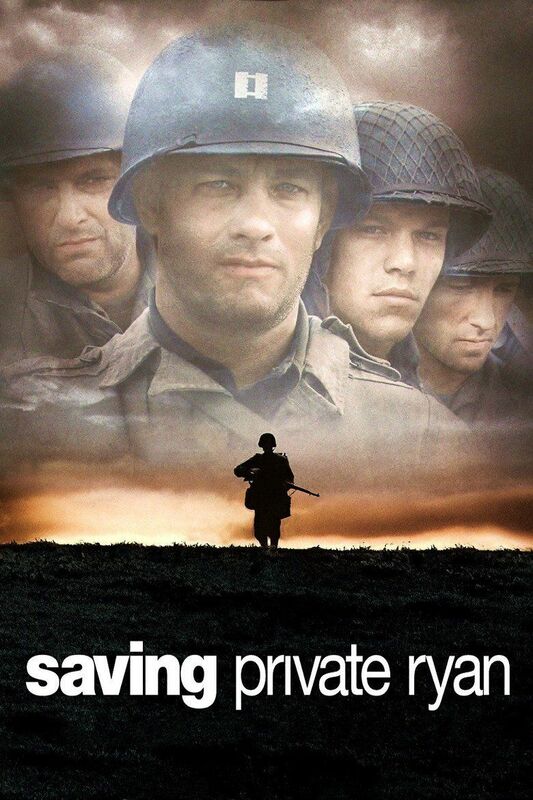 In 2004, a Saving Private Ryan special edition DVD was released to commemorate the 60th anniversary of D-Day. This two-disc edition was also included in a box set titled World War II Collection, along with two documentaries produced by Spielberg, Price For Peace (about the Pacific War) and Shooting War (about war photographers, narrated by Tom Hanks). The film was released on Blu-ray Disc on April 26, 2010 in the UK and on May 4, 2010 in the US, as part of Paramount Home Video's premium Sapphire Series. However, only weeks after its release, Paramount issued a recall due to audio synchronization problems. The studio issued an official statement acknowledging the problem, which they attributed to an authoring error by Technicolor that escaped the quality control process, and that they had already begun the process of replacing the defective discs.